The shape of British summers to come? Following this summer’s long heat wave, with weeks of hot sunny weather and hardly a drop of rain, there’s been a lot of talk about whether this is the new normal, thanks to man-made climate change. Fortunately, the Guardian’s climate expert Fiona Harvey has an article that sets the record straight on this, helped by top climate scientists such as Peter Stott of the Met Office. when it comes to global warming, we can forget the jolly predictions of Jeremy Clarkson and his ilk of a Mediterranean climate in which we lounge among the olive groves of Yorkshire sipping a fine Scottish champagne. The truth is likely to be much duller, and much nastier – and we have already had a taste of it. “We will see lots more floods, droughts, such as we’ve had this year in the UK,” says Peter Stott, leader of the climate change monitoring and attribution team at the Met Office. A series of unusually wet and cold summers has afflicted the UK for several years. Remember the devastating floods of 2007, when some areas received double their normal rainfall for June? 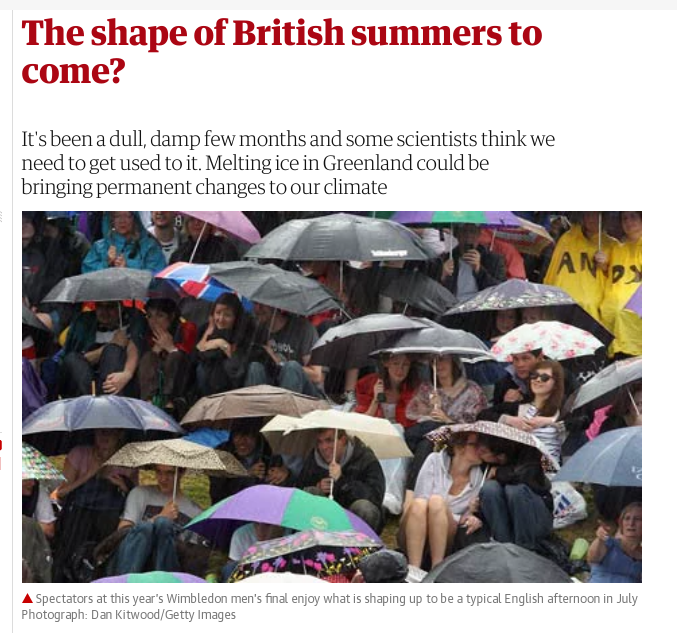 Or the predictions of a “barbecue summer” in 2009 that backfired badly on the Met Office as the (correctly anticipated) high temperatures were accompanied by heavy clouds and rainstorms? The impression that many Britons have had that summer weather has been getting worse in recent years is borne out by the data – five out of the last six years (2007-2012), have shown below-average sunshine from June to August, and in some cases well below average. All have had above-average rainfall – in some cases more than 50% above the long-term average. “It is not just a perception – we have had a run of relatively poor summers,” says Stott. The link, he believes, is that Arctic sea-ice losses and the release of heat over the Arctic Ocean have tended to weaken the jet stream and make it more meandering. This has brought more low pressures over Britain, less stable conditions, more cloud cover and rain-bearing weather systems from the Atlantic. This year, the jet stream moved much more than usual, passing south of the UK. It also persisted in this position for an unusually long time. If this pushing of the jet stream southward is indeed linked to less sea ice over the Arctic circle, as Hanna suspects, then the signs are that we will see many more of these wet summers in future. HT @strawbale23 on twitter who gave the link to the Guardian article. Tags: extreme weather, Met Office, science, Stott. Bookmark the permalink. I thought you were having a dry summer. Spain hasn’t had a heat wave all summer, until today, when Its getting hot everywhere. I noticed two interesting phenomena: ice cover is similar to previous years’, but ice mass is above average. And there’s a large dust cloud from the Sahara heading west, which seems to help keeping the ocean cool? I’m not sure about this last item, but I’m going to be keeping an eye on Dust extinction and water temperature to see if there’s a link. lol, what was the date of that article? See the link at the end. Heatwave causes severe memory loss amongst Met Office personnel and academic climate scientists. Clinicians identify a new syndrome. Climate alarmism is the new normal – in the media at least. 1) Global Warming is so extremely slow on human terms, that the general population are getting bored with being lectured to. They switch off. 2) Even if average temperatures eventually rise by 3C life will simply adapt. It is obvious that the hottest places on earth will hardly warm at all. They just cool faster. Look at the temperature records in Australia. 3) Sea level rise is still very slow and fairly easy to adapt to. Coral islands would grow naturally if people stopped mining the coral, clearing channels for fishing boats and building holiday resorts..
2) I suspect there is precious little really left to discover in climate science because at its core lies meteorology. The weather can only be predicted a maximum of 1-2 weeks in advance. The one unsolved problem is the cause of ice ages. The next one is due to start within 10,000 years. The climate extremists reject meteorology out of hand. Weather itself has been destroyed by “climate change”. In fact, judging from the news articles and climate hype (but I repeat myself), there is no longer “weather”. There is only proof of the impending doom of “climate change”. other whether bumps … according to CET long-term temperature record. “It sure does prove the existence of air”. It is wise to recognise that heatwaves have occurred before, but it is perhaps unwise to dismiss the claim that the current example is definitely not evidence of a warming climate. Alan, re ‘definitely,’ ah, there in’s the uncertainty. Alan Kendall: I have the impression that your last clause says the opposite of what you meant to say. Or perhaps not, and you’ve out Keyes’d Brad. Glory be, to challenge Brad in his chosen field was far from my intent. I tremble in anticipation of his return (and whether we will recognize it.) (The co-absence of Len and Brad might also be telling). My last clause implies that the current heatwaves could be the first of a long succession of hot summers, which would then definitely mark a climatic shift. We cannot fully exclude this possibility, however unlikely we believe it to be true. I thought that was it, but got thrown by the ‘definitely not’. I expect Professor Stott will get one of his scenarios right someday, along with the boy who cried wolf. I spent 10 years or so behind a counter in a semi rural post office, where people liked to talk about weather. I was impressed with how variable were people’s impressions of even the current season. When it came to ‘last winter’ or ‘summer last year’ a quick check against records often showed their impression of the whole season to be shaped by a few days. The same person might sometimes make the opposite case in conversations a week apart if the current weather had changed from, say, pleasant to cold. I expect this is an example of ‘recency’ psychologically, but to me it seems more common with weather than other subjects. The link is retained from the original article. It is not to a Committee Report, but to a 2014 journal article mentioned in the report and key to that report. The trend of increasing summer heatwaves was based on data from 1993 to 2006. 2003 and 2006 were years of heatwaves. The Fiona Harvey article is based upon the summers from 2007 to 2012. CHRISM56. What a little Nemo you are finding facts about Dory (wonderful analogy BTW). The next step is to determiine the nature of Fiona Harvey’s disremembering : repressive erasure (tick), prescriptive forgetting (double tick), formation of new identity (nah), structural amnesia (nah), annulment (? ), planned obsolescence (double tick), or humiliated silence (perhaps). My guess is that she is “pushing a consistent theme” and cares not whether, over time, she contradicts herself. The medium is the message. Alan – I am glad you liked the reference. Though I have to confess it only came to me as I typed the second to last sentence. If Marshall McLuhan’s meme is true, what is she doing writing for the Guardian? – that ever diminishing audience are the converted. It will have no effect on the great unwashed. Just shared the article with a person who has been, in the past, very open to ideas and thought. His comnent was that he saw the 2012 date and so what? Climate change ain’t a straoght line. So the hypesters have managed to reduce the critical thinking of someone who works in an intellectual field to..I don’t know how low. Some people didn’t get the joke/point. 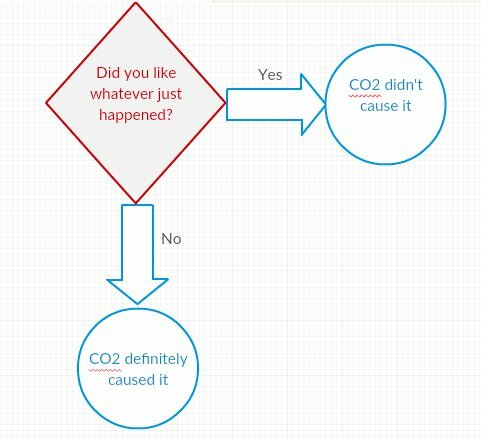 It is obvious that CO2 levels are not the determining factor for earth’s temperature. During the last interglacial temperatures were 2C warmer and sea levels about 3 meters higher, yet CO2 levels were only 280ppm. Fortunately Jaime has done a more serious post on this. I merely shared tge actual 2012 article. The goal was to not use spin but to let my friend see for himself that climste hypesters simply ckaim that whtever is the least bit “unusual ” in weather is “climate change”. 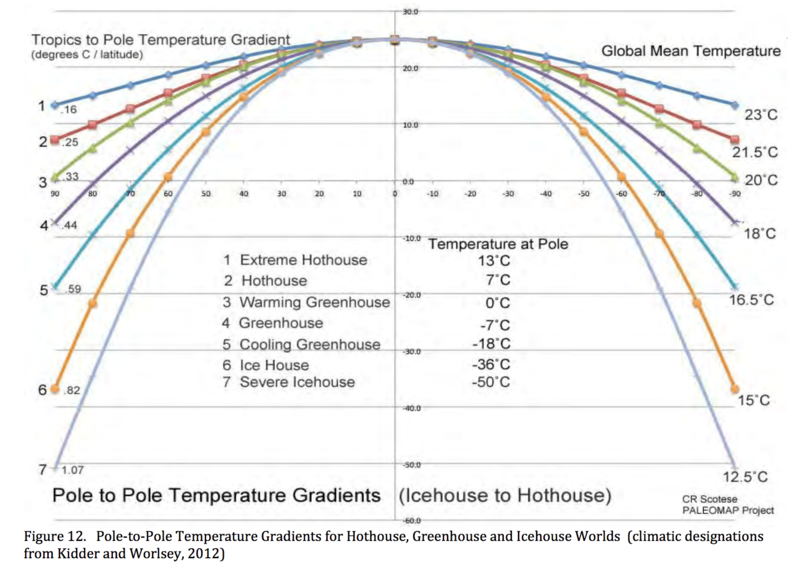 Instead he dismissed the article with rationale that “climate change” is not a straight line…. In other words, a lifelong professional who critically reads the writing of many people has been so desensitized to challenging climate hype that he missed the point. The 2012 article is quite significant. It was the sixth consecutive year of mild damp summers. Before that, 2006 was a summer of heatwaves and drought. 2003 had a very extreme heatwave across Europe. On the morning of Thursday 26th July, the Environmental Audit Committee launched a new report, with the headline “Heat-related deaths set to treble by 2050 unless Govt acts”. By an extraordinary coincidence on that very day the Met Office were telling us there could be a new temperature record set. The prediction of the increase in heat-related deaths is from Hajat et al 2014 “Climate change effects on human health: projections of temperature-related mortality for the UK during the 2020s, 2050s and 2080s”. The article was submitted in January 2013, comparing regional temperature and mortality data for the years 1993-2006. There might be something significant in the dates. 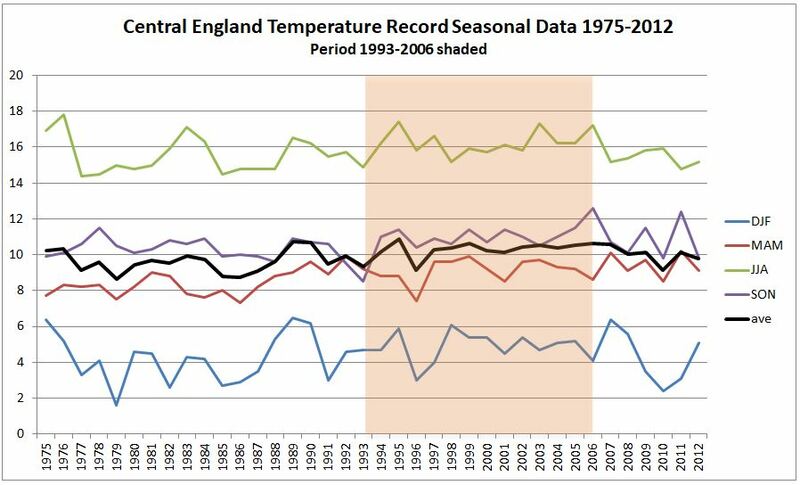 The Central England Seasonal Temperature Record gives more clues. In the paper, there were a few other assumptions that one might find a little odd, especially when used in 2018 as the basis of policy. In particular, there is the assumption of no adaptation. Most heat related deaths related to elderly in hospitals, followed by deaths in care homes. Would not one expect if there was a rise in heat-related deaths over many decades health professionals and carers might pick up on this and try to do something about it? Like install air-conditioners, make sure the vulnerable have plenty of water and monitor them more carefully than normal? Another assumption is that global warming continues unabated. The implicit assumptions are that the Paris Agreement and the UK’s costly climate policies will be completely useless. Based on current evidence, these assumption are realistic. Back in 2004 I published an analysis of the summer of 1540, after Luterbacher clamed thad 2003 was unprecedented. And prepare yourselves for the cold shock, that’s also an historic recurring pattern. This summer’s heat waves are having an unfortunate side effect. Some scientists who should know better are shouting wild claims as though their heads were exploding. Paleoclimatologists use terms like “Hothouse” Earth and “Icehouse” Earth referring to our planet’s climate shifts over many eons. One good old-fashioned hot summer is not a transition, or even an harbinger of an “Hothouse” world. More importantly, the distribution of temperatures in a warmer world is not the hell on earth depicted by these folks who have lost their bearings. Hi Paul, I really enjoyed the post. Not so the snide and insulting comment on the jounalist’s appearance. You’re better than that, and your arguments don’t need it. Do you not agree? Simon, glad you liked it. I didn’t make any comment on the journalist’s appearance though. My apologies to you – my mistake.